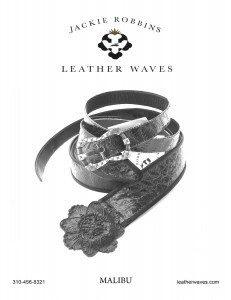 Many varieties of belts and styles from the Jackie Robbins Leather Waves Studio in Malibu California. Many varieties of belts and styles from the Jackie Robbins Leather Waves Studio in Malibu California. Many varieties of belts and styles from the Jackie Robbins Leather Waves Studio in Malibu California. Send us an idea about what you want, we can probably make it!